The sculpture of Phoenix symbolises the remarkable effort made by Bankstown Council staff, residents and friends to recover after a fire destroyed the Council's administration building on July 1st, 1997. A plaque on the sculpture also commemorates the opening of Paul Keating Park in 2000. 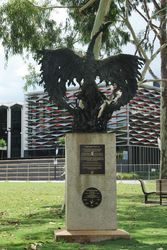 The Phoenix monument in Paul Keating Park was created by artist / sculptor Alan Somerville and took approximately 3 months . It represents rebuilding from the fire of July 1st 1997 and is a symbol of prosperity for the entire Bankstown area. Symbolising rising from the ashes and the rebirth of spirit. Bankstown's motto throughout the recovery effort was "Operation Phoenix - Spirit of Recovery'. The monument includes an historic plaque that tells the story of the devastating fire and recovery for future generations. In a gesture of friendship, Bankstown Council received funds towards the statue from its Sister City, Suita in Japan. 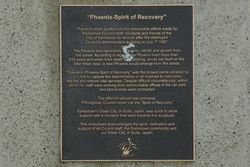 "Phoenix - Spirit of Recovery"
Councils Administration building on July 1st 1997. 500 years, when it felt death approaching, would set itself on fire. After 3 days a new Phoenix would emerge from the ashes. and phone lines were connected. The effort to rebuild was immense. Throughout, Council never lost the "Spirit of Recovery"
support with a donation that went towards this sculpture. our Sister City "Suita" in Japan.